Dragon’s Dogma surprised many for not because it strayed from RPG generica but for being an all-round very well made generic RPG. 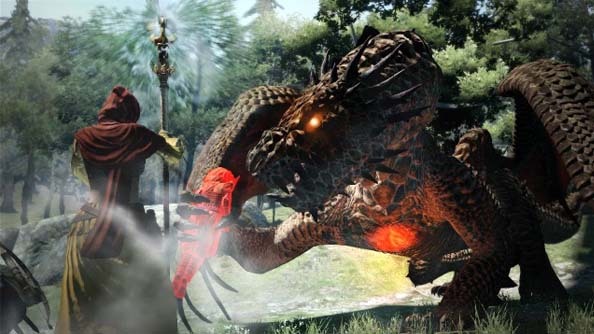 Well, with that accolade under its belt, Capcom have been hard at work on its sequel Dragon’s Dogma 2: Dark Arisen and they’re all very excited to show off what it looks like. It would seem that they’ve stuck with the theme of the first game swords, dragons, and the various situations in which the two come together, albeit, the setting has moved a few feet under the surface of the earth. There’s been a quick turn-around on development (400,000 game sales in the first fortnight will incentivise publishers like that) as the release date was today announced as 26 April. Less than a year since the release of the first. That suggests this may be a half-step sequel in the same way that Left 4 Dead 2 was a rapid-developmentsequel.